Choosing the phone for my latest upgrade was easy: I wanted the iPhone 6. What was difficult was choosing how to protect it. My last phone had a typical screen protector, a sheet of clear plastic. It kept the screen safe but it peeled at the corners, it had bubbles and nicks and it diminished the screen's clarity and sensitivity. This time, I wanted Apple's Retina display to shine, but without putting it at risk. My solution turned out to be the Classic Shell with Cover made by Tech 21. 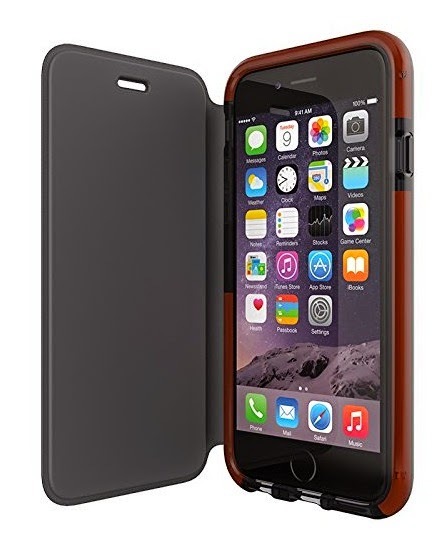 This is a case with a sturdy but pliable shell that also has a flip-over screen cover. The cover is lined with impact-resistant material called D30 but it's quite thin and it stay in place. The charging port and side controls are easily accessible, I can talk and listen with the cover in place and I can easily remove the phone when I want to put it in my dashboard mount. All that and it doesn't feel bulky in my poscket. Classic Shell with Cover costs $39.99 on the Tech 21 website where you can browse the company many other phone case designs.